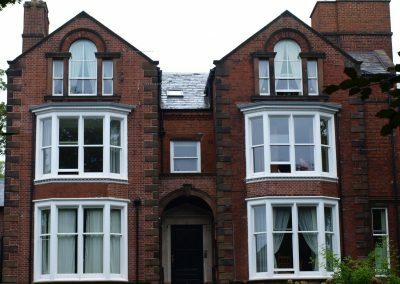 Replacement sash windows are manufactured and fitted into an existing brickwork opening that previously had a sash window in it. This includes the reinstatement of sash windows where the opening still exists but the original sash window has been replaced. 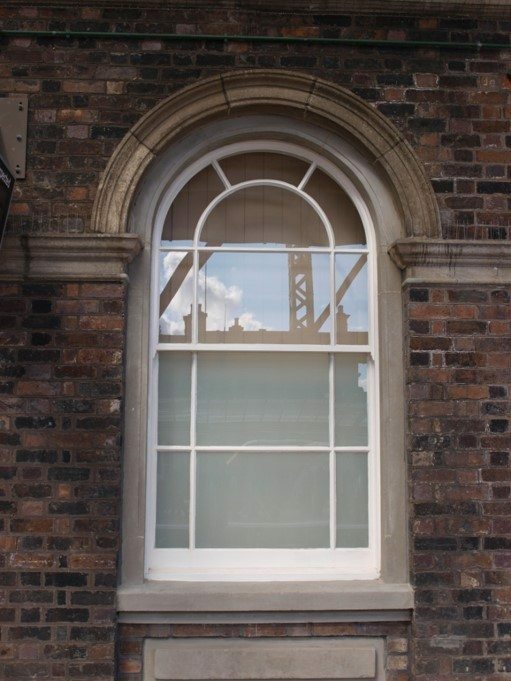 New sash windows are manufactured and fitted into a newly created brickwork opening. We manufacture all our sash windows bespoke and cater for all different styles and budgets for both new and replacement windows. 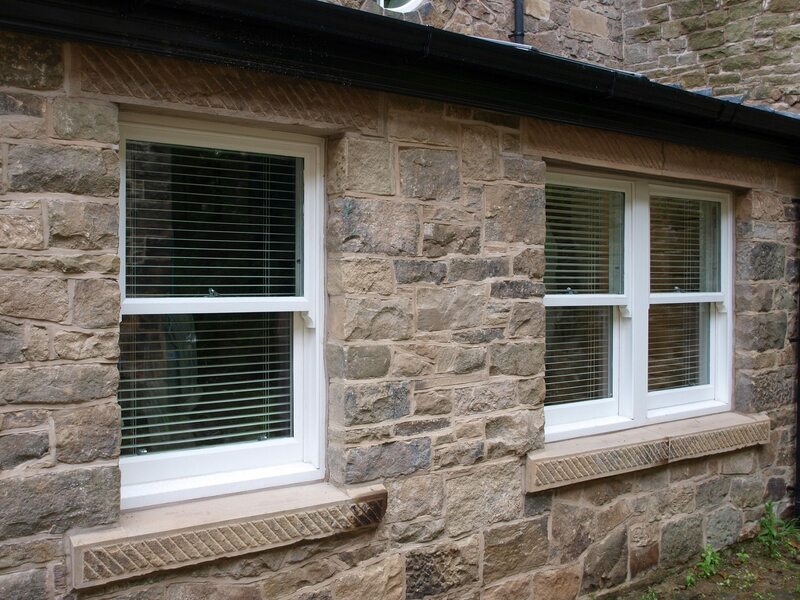 Whether you require supply only, supply only with our measure up service, supply and fit or supply and fit with opening creation, we can manufacture the sash window you require. – All finished windows are primed with microporous paint unless otherwise requested. If you’re going to the expense of fitting a new or replacement sash window then you might as well do the job properly. 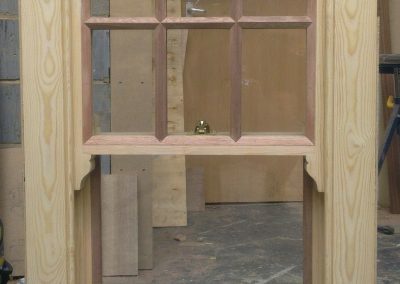 The bespoke nature of our workshop which manufactures with the traditional method of one man – one job, with all timber being machined to size on site, allows us to produce perfect replica sash windows. 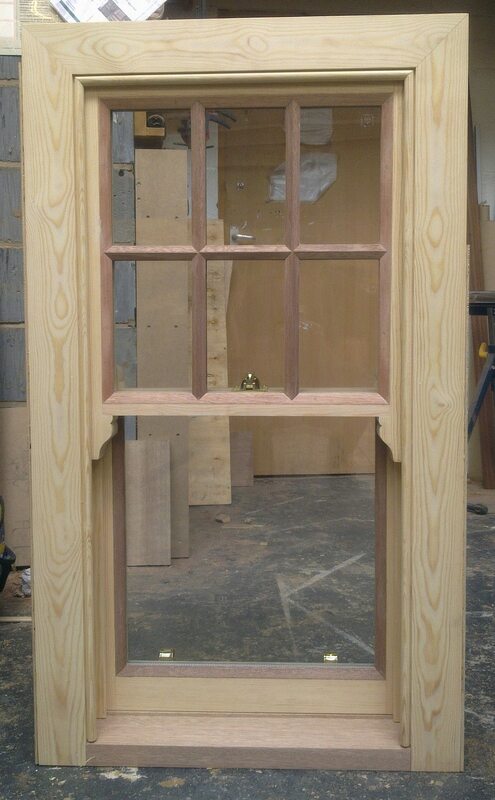 However, simply making a replica sash window will not suffice if you wish to maintain a perfect period look. 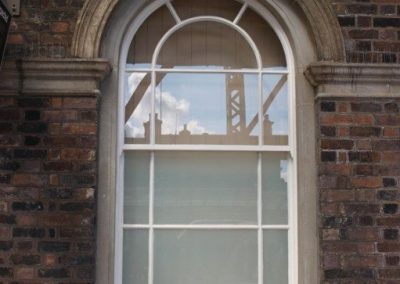 There are 3 key elements that need to be considered when manufacturing and fitting a new or replacement replica sash window. Only when all of these 3 elements external positioning, sash window composition, and internal finishing are taken fully into consideration, is it possible to fit a window that looks like it’s been there since the property’s original construction. Prior to 1709 windows were positioned in line with the external, usually timber, face of the building. However, after the great fire of London this was seen as a fire risk and hence the London building act of 1709 decreed that box sashes should be set back 4 inches from the face. The building act of 1774 further developed this by stating that sash boxes must be positioned behind the masonry. The result of this legislation is that today, nearly all sash windows are positioned behind the brickwork. When replacing an existing sash window it is essential that the original positioning is maintained, i.e. behind the brickwork with the same amount of visible outer face. This is relatively straight forward when replacing the original sash window, but can be more challenging when reinstating sash windows into an opening that used to have a sash window but perhaps now has a uPVC casement for example. For new windows it is important that the new opening is created in keeping with the rest of the property. 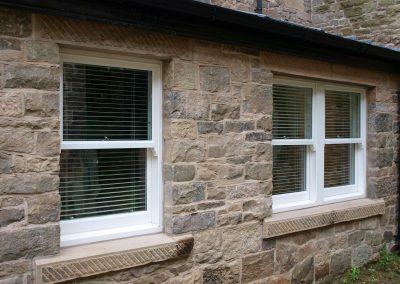 Stone sills and lintels should be matched, proportions should be maintained, and the sash window positioning should match any original windows. We work with various stone masons and quarries to ensure that any new window openings look just like the original ones. We measure the top rail height, style width, meeting rail height, bottom rail height, bottom rail angle of chamfer, glazing bar width, visible outer face, box depth, sill profile, etc. all to make sure the replacement sash window is a true replica of the original. We even trace the sash horns and scribe the inner moulding. It’s this level of attention to detail when manufacturing a replica that really sets us apart from other companies. 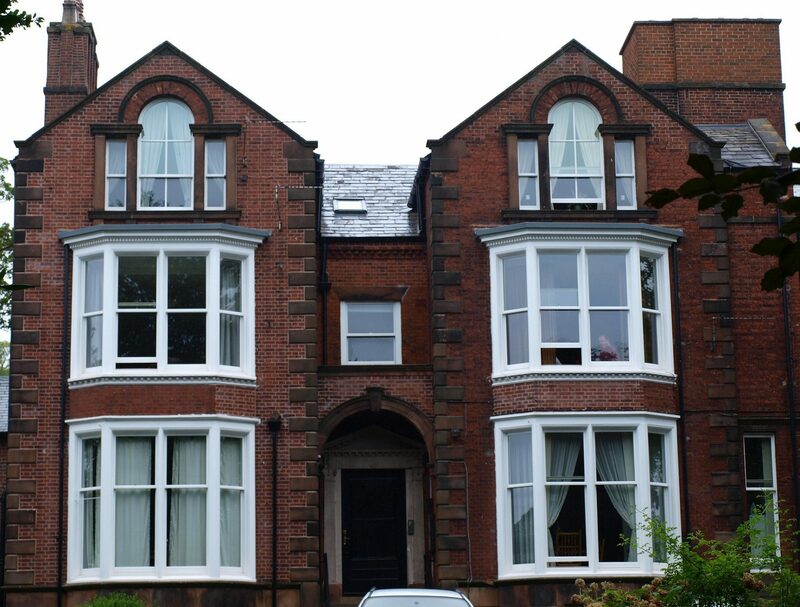 Most sash windows are box lined with a surrounding architrave and stub sill on the inside. Any new or replacement windows should be finished internally in an identical manor, if the original period look is to be maintained. Profile matching the design of your original architrave and stub sill is an essential part of achieving this. We will always advise clients of the best solution appropriate to their property and its period. However, sometimes budgetary constraints need to taken into consideration. 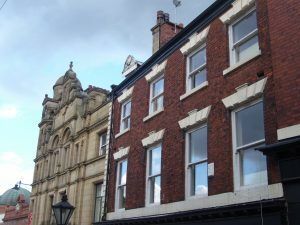 For example, replica stone sills and lintels can be quite expensive, so these could only be utilised on the front elevation of the property. We’ll always try to work with our clients so we can achieve the best possible outcome from the budget available. So if you have a problem with your sash window replacement Bristol based yoursashwindows.com‘s expert team are here to offer advice, please give us a call.